I have a 10 year old little girl and provide childcare for little girls ages 2 to 4. All of them enjoy any movies that involve princesses and Gigi God's Little Princess is no exception. 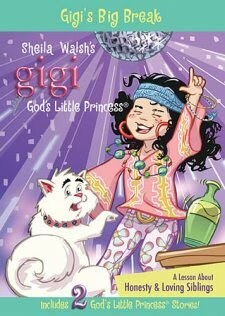 I was familiar with Shelia Walsh's books, but did not know their was an animated series. I recently received Gig's Big Break dvd and was quite pleased. Not only are their great stories kids can learn from, but there are fun songs as well. This series presents valuable life lessons and Christian values in a fun way. The first episode on the disc is The White Lie. Here Gigi learns the consequences of lying and how important it is to be honest. Gigi breaks a vase, then lies to cover it up. As lies often do, it goes from a small lie to a completely out of control situation. It is a good episode that teaches the importance of honesty. I very much enjoyed the fact that the lessons taught are backed up by scripture. The second episodes deals with Gigi, an only child, becoming a big sister. It explores all the fears that go along with a new baby as well as all the good things. This would be great for kiddos who are expecting siblings sometime soon. It talks about loving our siblings, as well as how parents love all their children. I recommend this video for little girls ages 3 to 8 or so. My daughter enjoyed them too, but not as much as the little girls did. I really like having a Christian alternative to mainstream cartoons. There are not enough shows that depict Christian families and values. This was a refreshing change from what the little girls normally want to watch. Ramblings of a Texas Housewife Product Review and/or Giveaway Disclosure- I received this DVD free from Thomas Nelson Publishers as part of their BookSneeze.com book review bloggers program. I have received no compensation other than the offer of free product to review and/or giveaway. Any opinions expressed on Ramblings of a Texas Housewife are my own. My reviews are never reviewed or edited in any way by sponsors.